As the new administration and 115th Congress get to work, the California Chamber of Commerce will be communicating its international trade priorities and support for working together to secure a national free trade agenda. Following confirmation, the CalChamber will be communicating with the Office of the Secretary of Commerce, the U.S. Trade Representative, and the new National Trade Council. California is one of the 10 largest economies in the world with a gross state product of more than $2 trillion. International trade and investment is a major economic engine for the state of California that broadly benefits businesses, communities, consumers and state government. California’s economy is more diversified than ever before, and the state’s prosperity is tied to exports and imports of both goods and services by California-based companies, to exports and imports through California’s transportation gateways, and to inflows and outflows of human and capital resources. Although trade is a nationally determined policy issue, its impact on California is immense. California exports to approximately 229 foreign markets. California trade and exports translate into high-paying jobs for more than 1 million Californians. America’s standing as a world leader depends directly upon its competitive success in the global economy. Over the last half century, the United States has led the world in breaking down barriers to trade and in creating a fairer and freer international trading system based on market economics and the rule of law. Increased market access achieved through trade agreements has played a major role in the nation’s success as the world’s leading exporter. International trade came under attack in the recent presidential election campaign and it is important for all to understand the significance that trade provides to the economy. Accordingly, promoting the ability of California companies to compete more effectively in foreign markets continues to be a high priority for the CalChamber, along with attracting foreign business to the state. The CalChamber opposes protectionist-oriented legislation that leads to higher prices and limited choices for consumers. The negative impact of this sort of policy often expands to include job loss in related industries, retaliation by our trade partners and violations in World Trade Organization (WTO) and trade agreement provisions. 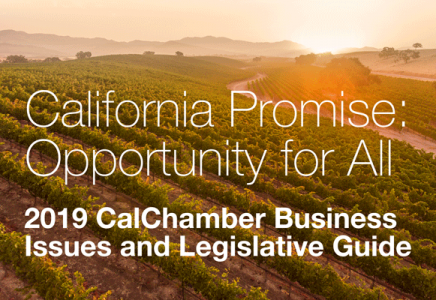 The CalChamber has supported a number of state and federal programs, but it should be noted that the CalChamber also dissuades the introduction of legislation that is unnecessary, unconstitutional or violates existing trade agreements. The U.S. Department of Commerce reported that in 2015, California exports amounted to $165.4 billion, a decrease from $173.8 billion in 2014. California maintained its perennial position as a top exporting state. Exports from California accounted for 11% of total U.S. exports in 2015. California’s top export destinations are Mexico, Canada, China, Japan and Hong Kong. California is a top exporter in the nation of computers, electronic products, and sales of food and kindred products. Computers and electronic products are California’s top export, accounting for 26.1% of all the state’s exports. Other top categories included transportation equipment; machinery, except electrical; and miscellaneous manufactured commodities. Trade agreements ensure that the United States may continue to gain access to world markets, which will result in an improved economy and additional employment of Americans. The CalChamber urges support of these trade agreements that will continue to keep U.S. and California businesses competitive. All in all, California must continue to engage in international commerce with the 95% of the world’s population which lives outside the United States, representing 80% of the world’s purchasing power. The World Trade Organization is the only global international organization dealing with the rules of trade between nations. Its main function is to ensure that trade flows as smoothly, predictably and freely as possible. At its heart are the WTO agreements, negotiated and signed by the bulk of the world’s trading nations, and ratified or approved in their parliaments or legislatures. The goal is to help producers of goods and services, exporters and importers conduct business. The WTO gives U.S. and California businesses improved access to foreign markets and better rules to ensure that competition with foreign businesses is conducted fairly. A large number of WTO ministers point to the growing number of regional trade agreements and stress the need to ensure that they remain complementary to, not a substitute for, the multilateral trading system. It is hoped that substantive negotiating will continue in the Doha Round in 2017 leading up to the next gathering of trade ministers in Buenos Aires from December 11–14, 2017. The Asia-Pacific region represents nearly half of the earth’s population, one-third of global gross domestic product (GDP) and roughly 50% of international trade. The large and growing markets of the Asia-Pacific already are key destinations for U.S. manufactured goods, agricultural products, and services suppliers. During the past decade, however, growth in U.S. exports to Asia has lagged behind overall export growth. The United States is gradually losing market share in trade with Asian countries, which have negotiated more than 160 trade agreements among themselves, while the United States has signed only three with regional economies (South Korea, Singapore and Australia). A Regional Comprehensive Economic Partnership (RCEP) could become the sole foundation for economic integration in the region. The RCEP is a proposed free trade agreement with 10 Association of Southeast Asian Nations (ASEAN) member states—Brunei, Burma (Myanmar), Cambodia, Indonesia, Laos, Malaysia, the Philippines, Singapore, Thailand, Vietnam—and the six states with which ASEAN has existing free trade agreements (FTAs) (Australia, China, India, Japan, South Korea and New Zealand). RCEP negotiations were launched in November 2012 and could conclude in 2017. RCEP includes more than 3 billion people (45% of the world’s population), a combined GDP of about $21.3 trillion, accounting for about 40% of world trade. It would be the biggest free trade agreement in the world, but without the United States or any membership from the Americas. The CalChamber would certainly consider supporting new bilateral free trade agreements in the Pacific region; however, the larger Pacific picture needs to be assessed for trade, investment, geo-political and strategic implications. The trans-Atlantic economic partnership represents the largest, most integrated and longest-standing regional economic relationship in the world. Together, the European Union (EU) and the United States are responsible for more than 11% of the world’s population, nearly half of global GDP, a third of global merchandise trade, and 40% of world trade in services. Either the European Union or the United States also is the largest trade and investment partner for almost all other countries. While Europe and the United States are not set to continue negotiations in 2017, the CalChamber is supportive of Europe and the United States continuing trade talks. In the interim, it may be that a U.S.-United Kingdom Free Trade Agreement is negotiated. The UK must exit from the EU before it can negotiate new agreements. However, a U.S.-UK FTA should be an easier negotiation as there would not be many of the controversial agricultural issues which would be part of a broader US-EU FTA. The CalChamber certainly would consider supporting such a new bilateral free trade agreement. The CalChamber actively supported the creation of the North American Free Trade Agreement (NAFTA) among the United States, Canada and Mexico, now comprising 484.3 million people, and combined annual trade with the United States being nearly $1.1 trillion in 2015. Mexico continues to be California’s No. 1 export market and Canada is No. 2. California exports to both countries are driven by computers and electronic products. The Trump administration will determine any actions regarding the future of NAFTA. Canada and Mexico have indicated they are willing to participate in an open dialogue. The business community must be considering how to best engage in case of such a process. In addition, the United States has successful free trade agreements with the Dominican Republic/Central America nations, Chile, Colombia and Peru. The CalChamber supports the Export-Import Bank of the U.S. (Ex-Im Bank) designed to assist in financing the export of U.S. goods and services to international markets. Ex-Im Bank enables U.S. companies—large and small—to turn export opportunities into real sales that help maintain and create U.S. jobs and contribute to a stronger national economy. Although an overwhelming majority in Congress voted to fully reauthorize the bank in December 2015, the chairman of the Senate Banking Committee stymied the bank’s full restoration by blocking action on nominees required to achieve a quorum for the Ex-Im Bank Board in 2016. In the absence of a quorum, the bank cannot approve transactions of more than $10 million. With economic growth and job creation the top priorities for the United States, Ex-Im has an important role to play. It is hoped this issue will come to resolution in Congress in 2017. Detailed information vital to the businesses that make California one of the largest exporting states in the nation and one of the largest economies in the world is available on the international trade section of the CalChamber website: www.calchamber.com/international.